The Astro Text tool allows for the free-hand placement of Astro Symbols on any chart. To add Astro Text to your chart, select the tool from the Astro tool group, and click on the chart on which you wish to add the tool. A symbol selector window will display, where you can click on any symbol combination. As you click each symbol it will be added to the chart. Add Astro Symbols: When selected the Astro Symbols window will be displayed to allow additional symbols to be applied to the chart. Add to Toolbar: Click this action to add the selected Symbol to your custom toolbar. Apply Settings to All: When multiple Astro Symbol tools have been applied to a chart, page or workbook, this action can be used to apply the settings of the one selected to other instances of the tool. This is a great time saver if an adjustment is made to the tool – such as hiding or adding levels- as this allows all the other Astro Symbol tools in the chart, page or entire workbook to be updated instantly. 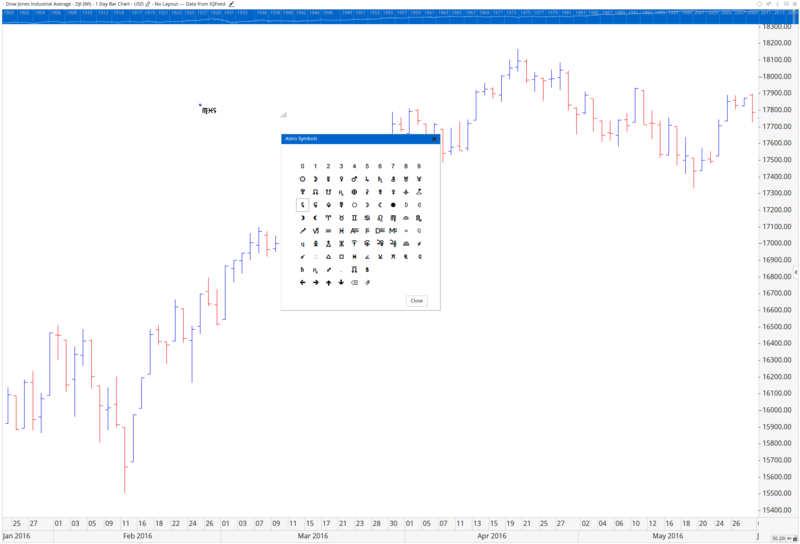 Copy Tool: Allows you to copy the selected Astro Symbol, which can then be pasted onto a different chart window. Move to Back: If the Astro Symbols are displaying in front of other tools or indicators clicking this action will move the lines view to the background. Move to Front: If the Astro Symbols are displaying behind other tools or indicators on the chart, clicking this action will bring the lines to the forefront. 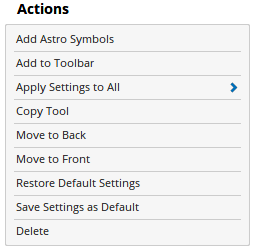 Restore Default Settings: Click this action if you have adjusted the default settings of the Astro Text, and wish to return to the standard properties originally installed with Optuma. Save Settings as Default: If you have adjusted any of the Properties (colour, for example) you can save the adjustments as your new default setting. Each time you apply a new Symbol to a chart, the tool will display using the new settings. Delete: Delete the Astro Symbol from the chart. Tool Name: Allows you to adjust the name of the tool, as it’s displayed in the Structure Panel. Colour: Allows you to select the colour of the Astro Symbol. Alignment: Can elect to display the Astro Symbol in different positions in relation to the anchor point, there are 3 options available: Left, Right or Center. Font Size: Allows you to adjust the size of the Astro Symbol. Moving the slider bar to the right increases the Symbol size. Width: Allows you to adjust the width of the text box where the symbols appear. Floating Text: Tick this checkbox to set the Astro Symbol as a floating object on the chart. This means the symbol will remain in the same position on your screen, even when moving forwards or backwards along the chart. Show Background: When selected a shaded background is displayed behind the applied Symbol(s). 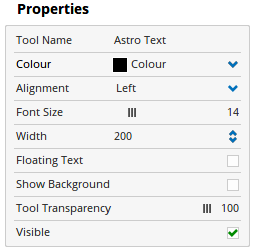 Tool Transparency: Use this slider bar to adjust the transparency of the Astro Symbol. Moving the slider to the left will increase the transparency of the tool.